Hours after PM Modi’s jibe at Rahul Gandhi over the One Rank One Pension issue, the Congress fielded war veterans to slam the premier for neglecting ex-servicemen. NEW DELHI: Hours after PM Modi’s jibe at Rahul Gandhi over the One Rank One Pension issue, the Congress fielded war veterans to slam the premier for neglecting ex-servicemen. The PM taunted Rahul while campaigning in Kangra in Himachal Pradesh which has a large concentration of ex-servicemen. Charging the government was trying to create a wedge between the retired and serving soldiers, Maj Gen (retired) Satbir Singh, Col Rohit Chaudhary, Gp Captain VK Gandhi, all of whom represent organisations fighting for OROP, said that to deny benefit of OROP to all serving personnel of the three armed forces is a cruel injustice. “It artificially creates two classes within the armed forces, one who retired before July 1, 2014 who will get benefit of OROP and those retiring after July 1, 2014 including all serving personnel of the three armed forces, who will not get benefit of OROP. It is neither logical nor just,” they said citing a government notification dated November 7, 2015. The veterans wondered if the ruling BJP government was immune to the fact that almost all junior ranks, particularly jawans/junior commissioned officers retire by the age of 40 years. “Only 30 percent officers get selected as Colonel. Majority of the remaining officers seek premature retirement on completion of 20 years of service. Number of personnel seeking premature retirement is also about 30-40 percent,” they said. Referring to the forcible eviction of protesting ex-servicemen and war widows from Jantar Mantar two days ago by Delhi police, the veterans said it showed the government intolerance towards any form of dissent. “Is this democracy Mr Modi,” they asked the PM adding the premier did nothing to fulfill the valid demands of ‘One Rank One Pension’. 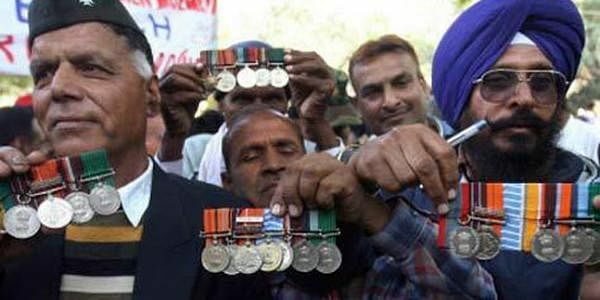 Congress spokesperson RPN Singh, who accompanied the veterans, said there was difference in what the previous UPA government had promised to the ex-servicemen under OROP and the version approved by the NDA government.